MULVANE, Kan. – Breaking records isn’t what steer roper Rocky Patterson is all about. The humble Pratt, Kan., cowboy just enjoys competing in an event he loves. Whether Patterson likes to boast or not, no one in the PRCA has ever had a more lucrative steer roping season than he just completed. Patterson won his fourth gold buckle with a single-season steer roping record of $141,350. He reached that milestone by earning $56,432 at the 2016 Clem McSpadden National Finals Steer Roping Nov. 11-12. “It’s big,” said Patterson, 50, about his latest victory. Patterson broke the previous single-season steer roping record of $121,112, set by Trevor Brazile in 2015. Chet Herren, Patterson’s traveling partner for the past 15 years, praised Patterson. Patterson has now won steer roping gold buckles in 2009-10, 2012 and 2016, which puts him in special company. Only Guy “The Legend” Allen (18), Everett Shaw (6), and Brazile (6) have more steer roping gold buckles than Patterson. Patterson was competing in his 22nd NFSR – only Allen (33) has made more NFSR appearances – and his latest NFSR outing was defined by efficiency. He placed in eight of the 10 rounds to propel himself to another gold buckle. Patterson, who has won 14 career NFSR rounds, didn’t add to that total, but he did place second in Round 1 (11.0 seconds), and Round 7 (10.3), and was third in Round 5 (9.4 seconds). His most important effort came in Round 10, when he placed fourth with an 11.1-second run to secure the gold buckle. “That steer was really good (Nov. 11). He was trying to kick me pretty good down there, so it felt pretty good when I got that time,” Patterson said. Lee clocked a 125.9-second total time, which secured first place in the 10-head average. Herren was second in the average with a 143.2-second time on 10 steers, followed by Patterson with a 105.2-second time on nine head. Although Lee wanted to win the gold buckle, he still left the Kansas Star Arena smiling. He won an NFSR-record $69,651, breaking the previous record of $62,390, won by Brazile at the 2015 NFSR. Lee, Patterson, Jason Evans ($44,456), Herren ($40,311), and Scott Snedecor ($38,794) had the top paydays at the 2016 NFSR. In other highlights, thanks to winning Round 2, JoJo LeMond won the Colby Goodwin Award. The Second Go-Round Award is given in honor of the late Goodwin, who passed away after being injured during the ninth round of the 1999 NFSR. 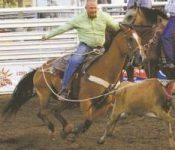 Goodwin won the second go-round at the 1999 NFSR. LeMond won an event-best three rounds – 1, 2 and 10 – and left Mulvane with $35,043. The only other multiple-round winner was Lee, with victories in Round 3 and 6. Allen, 58, won Round 5 with a lightning-fast 8.3-second time, tying the fastest run in NFSR history with Cash Myers (2006) and Jess Tierney (2015). That increased Allen’s record round-win total at the NFSR to 48. That total also is the fourth-highest number of go-rounds won at a National Finals event overall, including the Wrangler National Finals Rodeo. Only Brazile (64), Cody Ohl (52) and Billy Etbauer (51) have more round wins at PRCA Finals events. Allen’s time also was an NFSR record for Round 5, breaking the time of 9.0 seconds by Scott Snedecor (2007) and Vin Fisher Jr. (2015). Allen now holds the fastest NFSR round records in Round 5 and Round 7 (8.6 seconds, 2007) outright, and he shares the Round 4 record of 9.2 seconds with Brazile. He and Brazile each recorded those runs in 1999. Chris Glover, who finished 13th in the world standings with $55,444, won the Dixon McGowan Award, given to the highest-ranked first-time qualifier to the NFSR. The award memorializes McGowan, who died at age 23 in an automobile accident on May 10, 1997. Glover won Round 8 with a 10.1-second run.